The IWA World Water Congress and Exhibition is the global event for water professionals covering the entire water cycle. The 2018 edition took place in Tokyo last week (17-20 September) with a key focus the digital economy, megacities, diffusion of innovation, disaster resilience and sustainability. Isle accompanied to provide innovation support. This 11th edition of the IWA World Water Congress & Exhibition drew 9815 participants from 98 countries. Blanca Antizar presented the project H2020 INCOVER during her keynote “Turning Utilities Challenges into Low-carbon Opportunities” at the workshop “Utilities in Transition to High Performance and Low Carbon” chaired by Corinne Trommsdorff, Netherlands and Jose Porro, United States. 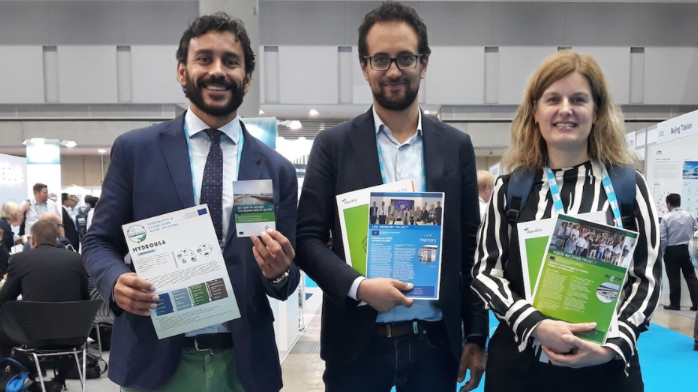 Other European Commission projects represented at the IWA World Water Congress included: H2020 Run4Life, Life Memory, H2020 SmartPlant, H2020 Hydrousa, H2020 POWERPLANT, FP7 P-REX and NewFert. From left to right: José Ramón Vázquez Padín (Aqualia), Francesco Fatone (Università Politecnica delle Marche), Blanca Antizar (Isle).